With coconut milk and Bombay Curry Butter, this rich and creamy puréed veggie soup with bone broth is soothing and comforting. 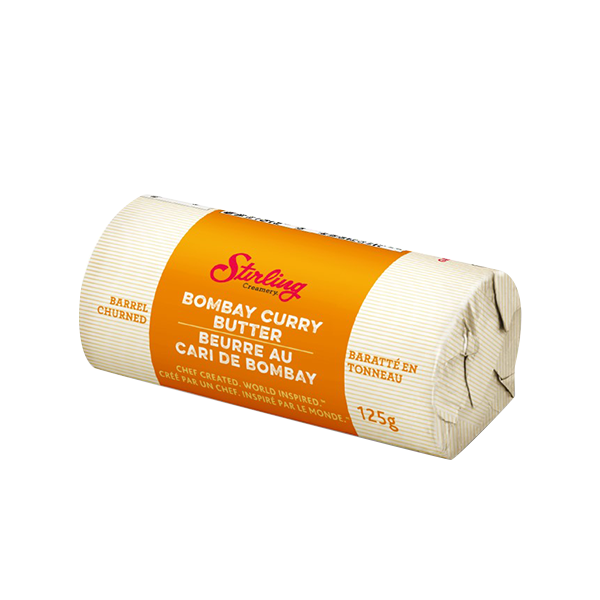 In large saucepan, melt 2 tbsp Stirling Creamery Bombay Curry Butter Roll set over medium heat; cook onion, ginger and garlic for 3 to 5 minutes or until softened. Meanwhile, melt remaining butter. Divide soup among bowls; drizzle with melted butter. Garnish with pumpkin seeds and cilantro. For an easy bone broth, add 2 lb (1 kg) chicken bones and 2 lb (1 kg) beef bones to large saucepan. Add enough cold water to cover; bring to boil over medium heat, skimming foam from top. Cook over medium-low heat for 3 to 4 hours; strain. Alternatively, cook in multi-function cooker or slow cooker. Substitute chicken or vegetable broth for bone broth if desired.